I made this PAW Patrol costume for my four year old son. Its his favorite TV show and Rubble is his favorite charter on the show. 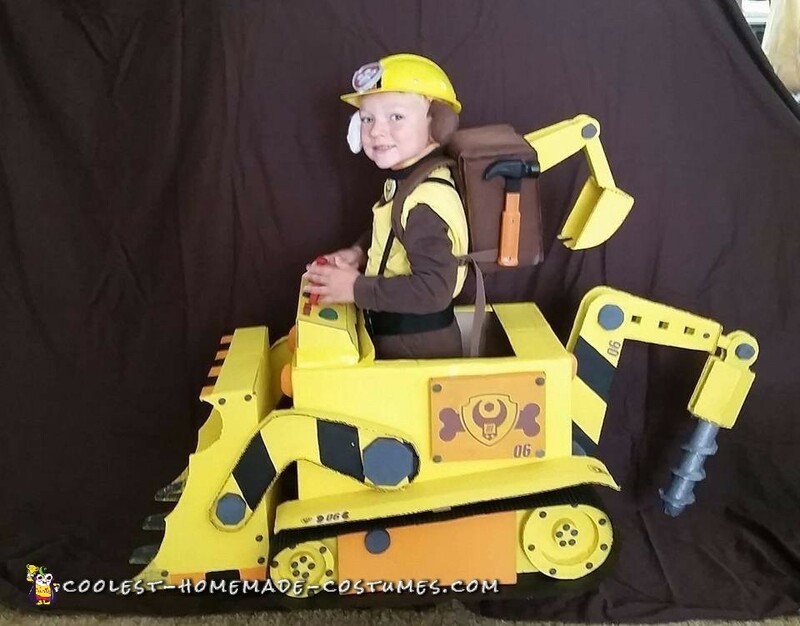 Rubble has a construction truck and pup pack which carries his mini shovel. I used cardboard, superglue, and duct tape. For the cabin area i used one large box that i just cut a whole in the top. Next I built the shovel out of a put together box to help avoid cutting more thanI had to. ThenI made the arms out of cardboard. I made all the large bolts from cardboard as well. For the back drill I used a paper towel roll and duct tape to form the drill piece. After that the drill was inserted into the box by cutting 2 slits for the pieces to tightly fit into and then glued with and abundant amount of super glue. The front arms were attached by just superglue. The tires were the best part for me. I simply took cardboard and separated it leaving the corrugated portion upright making it look like tire tread. Came out awesome. I also built the control panel with styrofoam pieces cut and wooden dowels and such for handles. I painted the entire truck with acrylic paint of various colors. I also made stickers for the truck and dog tag from a CAD program on my computer and put the images onto sticker paper. The pup pack is made from parts of a backpack cut and glued back together with felt around the cardboard pack. The shovel that is attached is made of cardboard and painted also with a sticker I printed from my CAD program onto sticker paper. I then used marker to cover and outline the pup pack. His dog ears I made from felt and attached to the strap of the helmet. The collar is just a pice of elastic with velcro along with a sticker pup tagI made from CAD program and put onto foam board. Lastly the truck has 2 elastic straps for comfort and manuverability.